Liquid natural gas and liquid petroleum gas are stored in steel alloy tanks at approximately -160C and -45C, respectively. These tanks need to be periodically inspected for cracks, corrosion, and other defects. Currently the inspection process involves sending a human into the emptied tanks with inspection equipment. In order to make the tanks safe for human ingress they need to be warmed for 10-14 days. The cost of this shutdown is about 15 million dollars per day and is still hazardous for the human inspectors. This project is to develop an inspection robot that can enter the tanks at much lower temperatures thus reducing the maintenance costs and limit the risk to human inspectors. There are many robotic inspection systems out there, but these systems are not designed for cold and hazardous conditions, thus they would not be suitable for placement into the tanks in question. 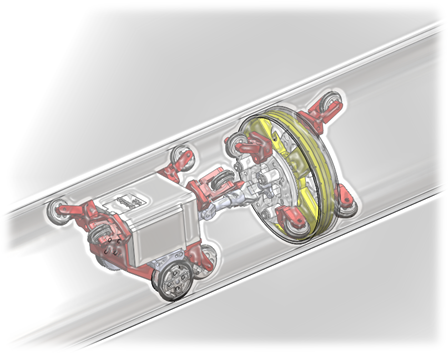 A new system needs to be designed which can work inside the tank under cryogenic temperatures and hazardous conditions to inspect the floor of the tank. Past work has been focused on the localization of the robot within the tank, and current work is investigating a thermal control system for the robot when operating inside the cold and hazardous environment.